Provide comfort for the family of Robert Barnhart with a meaningful gesture of sympathy. 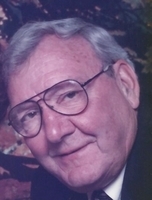 Robert (Bob) Barnhart 91, of Laurel passed away March 17, 2019 at Parkview Care Center, Billings MT. He was born October 2, 1927 in Wilsall MT to William and Marguerite (Davis) Barnhart. His Scottish grandmother named him after the poet Robert Burns, and he “wandered the Highlands and trails” of Montana throughout his life, as he grew up in the mountainous city of Livingston MT. There he was educated in local schools and graduated from Park High School. He joined the U.S. Navy during WWII serving as Machinist Mate. After the war Bob returned to his home town working briefly as a logger before gaining employment with Northern Pacific Railway. Bob Barnhart and Elizabeth (Libby) O’Neil were married in St. Mary’s church June 17, 1950 in Livingston where they began their family: John, Bob, Tim, Mike and Janet. After 15 years with Northern Pacific, an economic down-turn convinced Bob to attend college at Bozeman’s Montana State College where he received his Bachelor’s degree and went on to Iowa State Teachers’ College, Cedar Falls Iowa for his Master’s. Bob taught school in Terry MT and Lovell WY before settling in Laurel where he taught mathematics and Industrial Arts for 30 years, during which time he also drove school bus. Bob loved the Outdoors: hunting, fishing, hiking, camping, cross-country skiing and horse-back riding. He passed this love of outdoors to his family and others who were lucky enough to be part of his Boy Scout troop. Woodworking was another interest, and he could be found in his garage working on various projects. With the mind of a mathematician and the soul of the poet he was given the ability to design and build furniture, fix cars, and mend anything his five active children could break. His specialty in wood was the large oak rocking horses complete with leather bridle and saddle. Bob was active in Knights of Columbus, Boy Scouts, Benevolent Order of Elks, a charter member of the Laurel Golf Club, and the Park City Saddle Club. Survivors include his wife Libby of 69 years; son John of Missoula; grandson Joshua and great-granddaughter Isobella; son Bob (Cheryl) of Minneapolis and grandsons Erik, Chris, John Hallberg; son Tim of Laurel; son Mike (Mariann) of Chicago and grandsons Robert, James, and John; and daughter Janet (Mike) of Spokane and granddaughters Julia and Veronica; many nieces and nephews who have been an important part of his life. Bob also leaves behind a great group at Laurel’s gym. Please join us in celebrating Bob’s life on Wednesday, March 27 2019 at St. Anthony Church 3rd Ave in Laurel. Rosary is at 9:00 a.m. funeral mass at 10:00. Interment at Yellowstone National Cemetery with military honors at 12:00 p.m. followed by a luncheon at St Anthony Parish Hall. To plant a memorial tree in honor of Robert "Bob" Barnhart, please visit our Heartfelt Sympathies Store. Rosary is at 9:00 A.M.
May the family of Robert Barnhart please accept my sincere condolences hoping you find comfort in God's words at Acts 24:15 and Psalm 37:29.